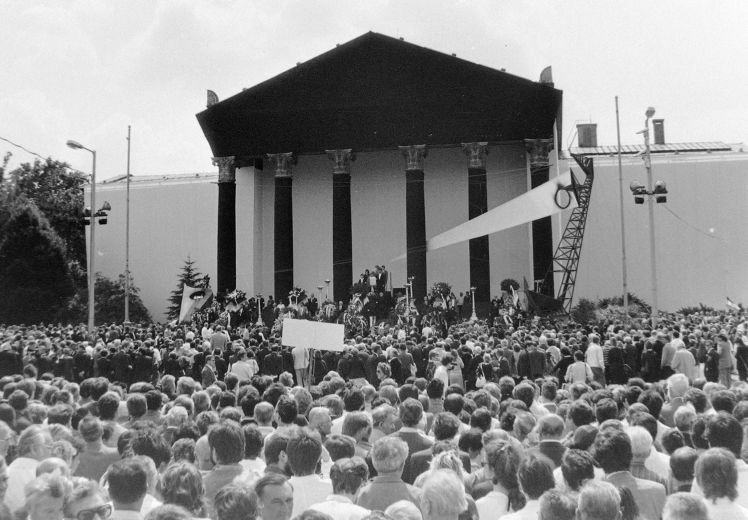 1989 was a year of fundamental transformations in Hungarian political and public life. It brought about the rehabilitation of the 1956 Hungarian Revolution, and, subsequently, the reburial of the executed Prime Minister, Imre Nagy, and his closest political allies on June 16; the dismantling of the Iron Curtain on Hungary’s Western borders; and the proclamation of the Republic on October 23. Throughout the year, thousands of people participated at political rallies, student protests, and alternative celebrations of major national holidays, such as March 15, organized by newly-formed civil groups and political parties. The latter formed the Opposition Roundtable to negotiate, with the ruling Hungarian Socialist Workers’ Party, the country’s peaceful transition to a multiparty democracy. With the political and legal framework for the functioning of the new republic agreed upon, Hungary was set to hold free elections in the spring of 1990. On August 19, the Pan-European Picnic was organized in Sopronpuszta, during which over 600 East-German citizens took advantage of the temporary opening of the Austrian border, and fled to seek refuge in the West. Three weeks later, the Hungarian government allowed the remaining East-German refugees to leave the country, a decision which won Hungary and its democratic transition international recognition. 25 years on, regardless of what we think about our participation, or how we remember it, it is important that we preserve our personal memorabilia and stories of these historical events, and share them with others. It is our own story that matters the most. The Open Society Archives is an international institution preserving documents on the history of Communism and the Cold War and of the human rights movements and violations worldwide. It promotes innovative archival research and public programs involving the collecting and publishing of user-generated historical sources. OSA has vast experience in collecting, reusing, and recontextualizing historical documents relating to the 1989 regime changes in Hungary and Eastern Europe. During its project entitled “Was there a 1989?” created for the 20th anniversary, it published unique and rare textual and audiovisual archival sources online every day for an entire year. The project won the Pulitzer Memorial Award in 2010. OSA is the project leader of Europeana 1989 in Hungary. During the Hungarian collection campaign, it cooperates with the SZTE Klebelsberg Library of the University of Szeged and the Museum of Sopron. The SZTE Klebelsberg Library, with more than 1,500,000 printed volumes and 50,000+ digital resources today, provides cutting-edge services to students, researchers, and professors, tending to their needs in terms of information literacy, searching, archiving, digitizing, and borrowing. It also has a small collection of recent historical documents, publications, and samizdat. The Museum of Sopron spans several monument buildings in the city. It is one of the Hungarian museums with the most exhibitions, which display a wide range of themes from the archaeological to bourgeois urban lifestyle, and from Roman times to recent local history. The latter includes material on the role of Sopron in 1989: the cutting of the barbed wire fence between Hungary and Austria, and the Pan-European Picnic. A short film on the collection days in Poland in June 2013 is avalable here.